Glyceria striata (Lam. ) Hitchc. Culms: Erect to decumbent at base, slender, smooth, firm, tufted, often rooting at lower nodes. Blades: Erect or ascending, flat or folded, 4 to 16 inches long, 1/8 to 2/5 inch wide, smooth to rough, pale green. Sheaths: Closed to near summit, rough. Ligules: Membranous, truncate, less than 1/6 inch long. Inflorescences: Panicle, open, 4 to 10 inches long, pale green or purplish; branches numerous, slender, wavy, ascending at base, drooping at tip; lacking spikelets on lower 1/3. Spikelets: Mostly crowded near tips of branches, 3-6-flowered, ovate or oblong, 1/10 to 1/6 inch long; glumes unequal, much shorter than adjoining florets; lemmas blunt, slightly rough, prominently 7-nerved. Habitat: Stream, pond and lake margins, moist meadows, open marshes, wet woods. Forage Value: Some forage value but may occasionally contain cyanogenetic compounds. Comments: The name is in reference to Biblical manna. 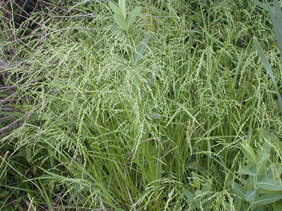 In Europe, mannagrass refers to several species of grass whose seeds are used to make flour.